YOUR NEW GLOW TO DESTINATION. A Spray Tan Your Skin Will Love! Be Bronze was founded on the conviction that a beautiful tan should never come at the cost of premature skin aging or harmful UV exposure. Your skin is a reflection of your overall wellness, and our philosophy is that beautiful skin begins with exceptional skincare. That is why our spray tan formula actually nourishes and improves your skin while giving you a glow that will mesmerize everyone who lays eyes on you. Our custom quick-dry bronzing solution is made with FDA-approved ingredients, which are free of harmful toxins and contain an anti-aging complex to enrich your skin one tan at a time. Look as great on the outside as you feel on the inside with a spray tan that actually improves your skin! Our spray tan solutions is loaded with botanicals and antioxidants that create the perfect cocktail to nourish and enrich your skin. We’re serious about sun protection. A tan shouldn’t come at the cost of pigmentation and premature aging. Our spray tan will instantly turn you into your desired shade of…Bippity Boppity Bronze! When selecting your shade of bronze, we consider your features such as skin type, and hair color, as well as the occasion! Your tan can be designed to be in line with the season, a special occasion, or a photoshoot! Our professional spray tans also include micro-shadowing to show off all your delicious curves. WE ARE METICULOUS ABOUT WHAT GOES ON YOUR SKIN. Be Bronze is a glamor destination that helps our guests feel beautiful and confident. Our flawless, skin-improving spray tans will let your true inner beauty shine through. Our philosophy is that beautiful skin begins with exceptional skincare. That’s why our custom airbrush spray tan solution is made only with FDA-certified ingredients, free of harmful toxins. Our solution contains an anti-aging complex that nourishes and enriches your skin one spray tan at a time. Book an appointment with our LA spray tan salon today and get the best spray tan of your life! We take your skin seriously. Our method involves custom color mixology using a solution that develops and fades evenly and glows naturally for up to 10 days. We currently offer two different spray tanning services with some great add-ons coming soon. Be Bronze is dedicated to creating bold and beautiful spray tans at our studio, which services Hollywood, Beverly Hills, and Los Angeles. 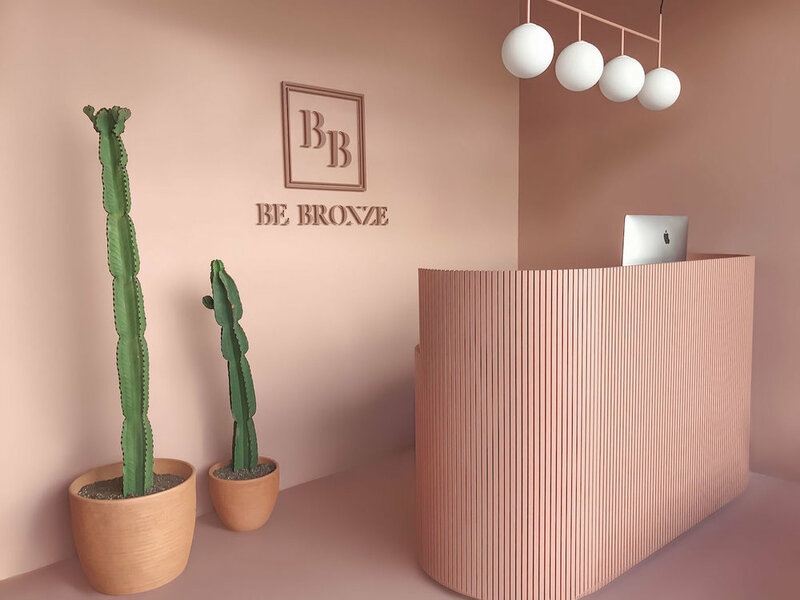 This one-of-a-kind spray tan salon was developed by Brittney Bennett and Anna Kudrjasova, two savvy and uncompromising women who believe that exceptional skincare and beautiful, glowing tans are not mutually exclusive. Together, they created a different kind of tanning salon that nourishes skin and brightens the confidence of all their guests. If you want the best spray tan of your life, then what are you waiting for? Book your appointment to receive a customized tan from one of our professional mixologists. Let your true beauty shine through! Get your professional spray tan at Be Bronze today.